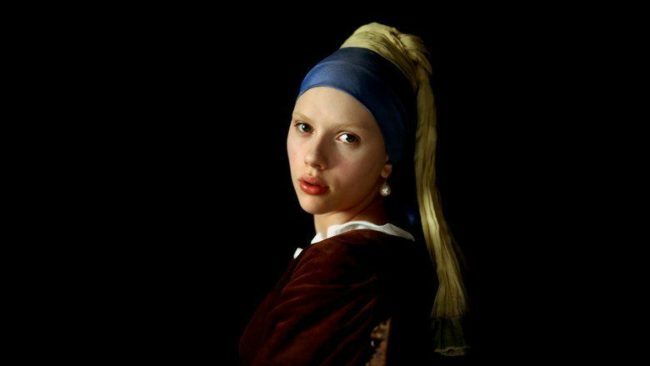 Girl with a Pearl Earring tells the fictional story of a 17‐year‐old maidservant called Griet (Scarlett Johansson), who starts to work in the household of Delft‐based artist Johannes Vermeer (Colin Firth) in 1665. Much to the detest of his jealous wife, Vermeer then chooses Griet to be the model for one of his most famous paintings: The portrait that has become known by the name "Girl with a Pearl Earring". Only a few scenes of the film were actually shot in Delft as the majority of filming took place in nearby Belgium, Luxembourg and Amsterdam. Delft was, however, the real‐life hometown of the artist Johannes (or Jan) Vermeer (1632–1675), who lived and worked here his entire life. In Vermeer's painting "The Procuress" (c. 1656), the man holding a glass on the left is thought to be the artist himself. Delft's historic city centre is small and compact and can thus be easily explored by foot. Read more about visiting Delft in my travel post A quick guide to Delft. In the first and last scenes of Girl with a Pearl Earring, Scarlett Johansson aka the maid Griet crosses the market square in Delft. In the back of this scene, you can see the medieval Town Hall, which still looks exactly the same today as it did in Johannes Vermeer's times. You can see this view of Delft's Town Hall and the New Church in the back several times in the film. And just as in former times and in the film, the square in front of the Town Hall still hosts a market several times a week. Furthermore, you can spot the steps of the stone bridge that Griet walks across in the film (if you stand in front of the Vermeer Centrum, turn right and walk along the Voldesgracht until you reach the back of the New Church). With the Combiticket, you will also get a leaflet for the self‐guided Vermeer cube walk (which normally costs 2.50 €) as well as a coffee or tea with a Dutch syrup waffle in the Café Mechelen inside the Vermeer Centrum. The Vermeer Combiticket costs 22 € and is available at Delft's tourism information point VVV Delft (Kerkstraat 3) or the Vermeer Centrum Delft (Voldersgracht 21). It's up to you, which of your Vermeer Combiticket attractions you check out first. You don't have to do them all in one day as the ticket is usually valid until the end of the year. But for a good first overview of the city, I recommend to start with the "Vermeer cube walk". It's called "cube walk" because you will see various "cubes" with information about Vermeer's work and life, spread all over town. A particularly beautiful neighbourhood is the Vlamingstraat area around Vermeer's "Little Street". On the walk, you will pass by the streets where Johannes Vermeer was born, where he grew up and where he lived with his wife Catharina at the time in which the film Girl with a Pearl Earring is set. His house is gone, but this is the exact street where Johannes Vermeer lived with his family in Delft. You can also trace the locations of Vermeer's famous Delft paintings "The Little Street" (now exhibited in Amsterdam's Rijksmuseum) and the "View of Delft" (now in the Mauritshuis Museum in The Hague, see no. 6 in this post). The real‐life location of "The Little Street" is likely to be between Vlamingstraat 40 and 42. Vermeer's painting "View of Delft"
The modern "View of Delft"
To see even more of Delft, I recommend the combi tour "Delft City Tour" (1 hour canal boat tour + 1 hour walking tour + a cute little Delft souvenir at the end) by Happy Day Tours Delft. 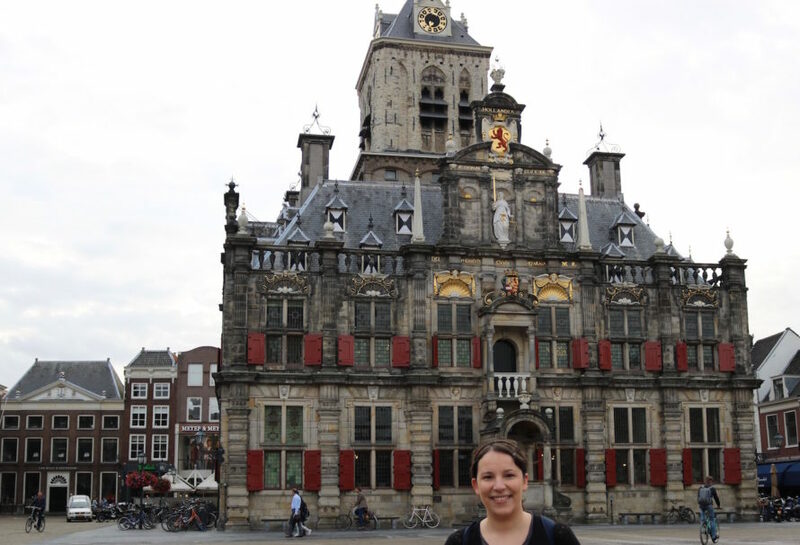 Read more in my post Discover Delft by boat: My Review of the most Dutch Tour to take in Delft. If you want to know how those typical Delft canal houses look like from the inside, I recommend a visit to the Museum Paul Tetar van Elven on Koornmarkt 67. Once owned by the Delft painter, copyist and collector Paul Tetar van Elven (1823–1896), this house has been lovingly restored as to how it would have looked like in the 19th century. Originally though, the house is much older as it was built shortly after the big town fire in 1536. In former times, the top floor (the attic) was almost certainly reserved for the servants. Going up here gives you a little bit of an impression of Griet's servant life in the film. After she starts mixing colours for Vermeer before and after her shifts as a housemaid, Griet (Scarlett Johansson) sleeps on the floor of the attic because this is the location of Master Vermeer's art studio. Entry is 5 € for adults and there are usually volunteers who are happy to tell you about the intriguing history of the house. For more info, check out their website. Now it's time to see the lady herself! The original Vermeer painting of "Girl with a Pearl Earring" is located inside the Mauritshuis Museum in nearby The Hague. Just hop on the tram and you will be in The Hague in about 30 minutes. For 6.50 €, you can get a day ticket for unlimited travel on all trams and busses in Delft and The Hague from Delft's tourism information point VVV Delft (Kerkstraat 3). Aside from Vermeer's two masterpieces "The Girl with a Pearl Earring" and "The View of Delft", the Mauritshuis features many other renowned art works – including several famous paintings from the so‐called "Dutch Golden Age". For your tour through the museum, I would recommend getting an audio guide for an additional 3.50 € or downloading the (free!) smartphone app as the written information on the walls is very sparse. It basically just states the painter and the year. 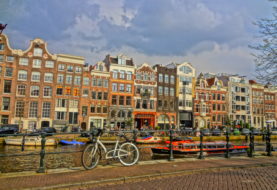 There is lots to see in the Netherland's third largest city. 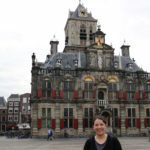 Thus, I would recommend to combine your day trip to The Hague with a guided tour by Elswhere Tours and you can be sure to tick off all the highlights of the city in one day. Freelance guide Els offers both a free (tip‐based) walking tour as well as differently themed paid tours, such as the Historical Gossip Tour on Sundays. Check out Elswhere Tours for more info! The Binnenhof (or Inner Court) in The Hague is the seat of the Dutch Parliament and also served as a filming location for "Ocean's Twelve". The Mauritshuis Museum is open Tuesdays‐Sundays from 10 am to 6 pm and Mondays from 1 to 6 pm. Tickets are 14 € for adults and can be bought online or in person at the main ticket office in the reception hall. 7. Get the best Delft souvenir photo ever! If you're a girl, you're in luck because with just a few props, local artist Barbara van Gelder will turn you into the Girl with a Pearl Earring yourself! The photo costs 10 € and already includes one print. A "golden" frame is an additional 5 € and if you want an assistant to take some photos with your own camera, it's 2.50 € more. I did all of that and paid 17.50 € in total. For a historical photo shoot at "Something Extra", drop by the studio on Oude Langendijk 36. The studio is not always open, so if you only have limited time in Delft, you can make a reservation via the artist's website. I hope you find my 7 tips to trace the Girl with a Pearl Earring in Delft useful. If so, leave a comment below. I'd love to hear about your travel experiences! For more information about visiting Delft on a film‐inspired trip, check out my post A quick guide to Delft. Disclosure: In order to write my review, I received a complimentary Vermeer Combiticket by VVV Delft, complimentary museum entry by the Mauritshuis Museum as well as a complimentary ticket for the Delft City Tour by Happy Days Tours Delft. The views expressed in this blog post, however, are entirely my own and thus reflect my personal, unbiased experience.